They walked the earth in times forgotten—Elder Gods and cosmic horrors from beyond the heavens. Ancient, malevolent creatures, their names still echo through the ages in tales by the great pulp authors such as H.P. Lovecraft, Robert E. Howard, and August Derleth. Featuring tales by writers: Tony Simmons, S. Brady Calhoun, Ainslee Meadows, Tim C. Taylor, Anthony S. Buoni, F. P. Calabretta, and Nathan Simmons, with an introduction by Mark Boss. And with chilling illustrations by artists: Jason Godwin, j(ay), Herb Kalenberg, Jayson Kretzer, Jason Miracle, and colors by Andrew Pate. This third volume of Adventures in the Arcane is brought to you by The Syndicate Studio. I was a backer for this project on Kickstarter and received a PDF version. Having read the previous editions I knew the quality would be delivered, and it most certainly has been. What I love about anthologies like this is the variety. If something doesn't quite click with you, there's always the next tale. Also, you might just discover a new writer and style you otherwise would never have encountered. I'd say for the money here you can't go wrong, a super value. Plus, the artwork inside and out is stellar. Buy it now, Cthulhu commands you! 5.0 out of 5 starsYou need this in your collection. Everyone needs a good Cthulhu book in their stash, unfortunately this isn’t it...this is a GREAT book! 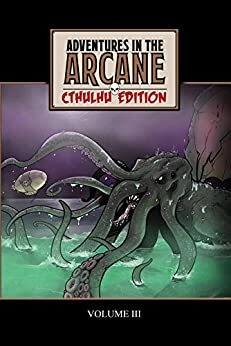 The combination of different styles that each Author brings to the Cthulhu Mythos makes this anthology a hard to put down read. Combine these stories with the exemplary artwork, and you have a book you will want keep and revisit, like the two previous volumes, for a very long time to come. 5.0 out of 5 starsA good variety of stories. A great value. These are very good stories if the Cthulhu mythos. There is good variety, and the stories of not disappoint.